The answer is yes. Right now there are over 240 million mobile browsers online verses 200 million pc browsers. When you open up a mobile website through Safari on your iPhone or any internet browser that you use on a smart phone- you will see that your website does not portray in the same lite as it is supposed to. It probably looks a little disfigured and blurry at first glance. That is because the browser actually disfigures your website, which doesn’t allow you to see the central flash or the fancy script that makes your website look modern. Jumbled Content Blocks with no flow of content. This is because your website is not designed for a mobile screen, since it is much smaller. Since you are trying to cram to much information into such a small screen that is usually viewed in a 12 inch monitor- the screen shows complete chaos. Each Mobile Website is made to fit into a mobile screen. It will compatible for all browsers. Your website will be user friendly and functional on all mobile smart phones. Have you mobile call to actions, so you don’t lose business through search. All images, content, and designs will be legible. You won’t have to zoom in or zoom out to navigate. Noxster SEO Company will help with the transition of getting your website to be compatible with mobile phones. We offer mobile optimized web designed and mobile app development. We also offer print solutions to drive customers straight to your phones application or mobile web devise. As you can see from the stats above mobile marketing is growing at very high rate. People are looking for businesses on their mobile devise, tablets, and mobile computers. At Noxster SEO Company we will make sure the transition to mobile is as seamless as possible. 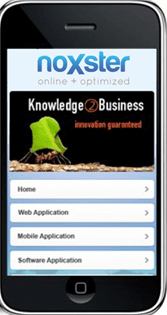 The design for your mobile app with is user friendly, fast, and efficient. We will make sure that your mobile brand fits your brick and mortar identity. The best part, you can connect your Google Analytics to your mobile website to track all the same data that you can from your website.